The sensitivity, power and lightweight feel of a Fenwick® HMG Ice Fishing Spinning Rod will make it a fast favorite in your ice fishing arsenal. With high-modulus blank construction, twist-lock reel seat, and stainless steel guides with aluminum-oxide inserts, HMG Ice Rods deliver pro-grade performance at an every-man price. Choose from a wide selection of sizes and action to fight the fish you're going after. 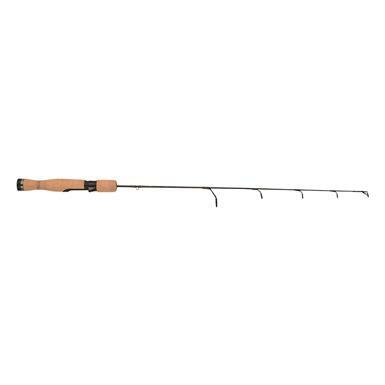 Fenwick HMG Ice Fishing Spinning Rod is rated 5.0 out of 5 by 3. Rated 5 out of 5 by Drewbone1 from Great Price Like the action of this UL. Really like my Fenwick Elite Tech rods and wanted to try this HMG because of the price. Good feel and like the Fenwick quality. Rated 5 out of 5 by djm53 from Great Action Great rod with great feel. The rod reacts awesome when a fish starts nibbling at the bait.